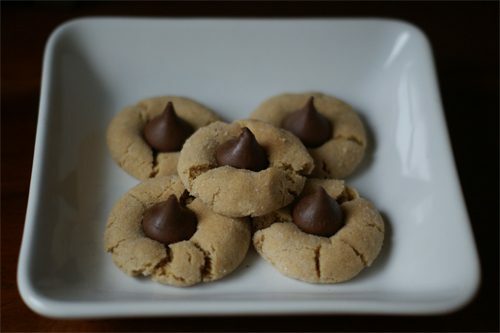 Peanut butter blossoms are one of my favorite Christmas cookies. There’s nothing particularly Christmas-y about them, and I’ve been known to make them at various times during the year, but I always, always make them at Christmastime. These are fun and easy to do with the kids, and even little ones can easily help unwrap the chocolate, roll the cookie dough in sugar and press the kiss into the baked cookies! So…confession time: I like to eat the peanut butter cookie around the edges first and then pop the kiss and remaining cookie into my mouth at the end. What about you? Preheat oven to 375 degrees F. Unwrap the chocolates. In a large bowl, beat the shortening and peanut butter well. Add the granulated and brown sugars and beat until fluffy. Beat in egg, milk and vanilla. In a separate bowl, mix flour, baking soda and salt. Slowly beat into peanut butter mixture. Shape dough into 1″ balls (I like to use a melon baller) and roll in granulated sugar. Set the balls 1″ apart on a cookie sheet or stone.